If you’ve missed our Mother Essentials column, it’s baaaack! And we can’t think of a better person to kick off our 2019 series with than Ylleya Fields, the Cleveland-based mother of 6 (!) behind the spunky Princess Cupcake Jones series. The PCJ character was birthed when Ylleya’s eldest daughter was just a toddler and she was struck by the limited number of books featuring black lead characters. The idea has since blossomed to include five Princess Cupcake Jones children’s books, along with accessories, apparel, and toys featuring Ylleya’s lovable creation. 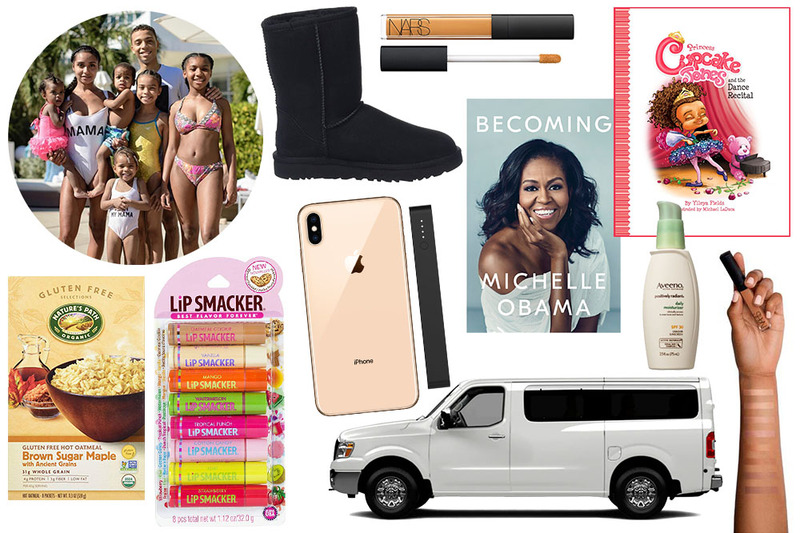 Below, the inspiring entrepreneur and devoted mother to DJ (20), Donna (14), Dakota (11), Grey (4), and twins Phoenix and Prime (2), shares her current Mother Essentials (including the ultimate vehicle to transport her crew!). Nature’s Path Gluten Free Oatmeal, $9.24, Amazon. Lip Smacker Original Flavors Lip Gloss Party Pack, 8 Count, $7.68, Amazon. iPhone XS Max, $1,099, Apple. Mophie Powerstation External Battery for Universal Smartphones and Tablets, $39.99, Amazon. UGG Women’s Classic Short II Boot, $159.99, Amazon. Nissan NV 3500, $35,170, Nissan. Becoming by Michelle Obama, $19.96, Amazon. Princess Cupcake Jones Won’t Go to School, $15.36, Amazon. NARS Radiant Cream Concealer, $30, Ulta. Aveeno Positively Radiant Moisturizer, $13.40, Amazon. Watch Ylleya’s daughter Grey’s adorable channel here. Sweat X Sport Laundry Detergent, $19.99, Amazon. Princess Cupcake Jones Bookbag, $35.99, Princess Cupcake Jones. For more on Ylleya, check out her website and Instagram feed! And for more Mother Essentials, peep our past columns with artist Kindah Khalidy, jewelry designers Lauren Godfrey and Maggie Gavigan Smith, Oakland retail queen Sherri McMullen, PR pro Priscilla Vega, Courtney Klein of Storq, Joanne Encarnacion, LaTonya Yvette, Morgan Walker of Make.do, Jeanne Chan of Harlow & Grey, and more.